Moore Marine’s fully equipment workshop to able carry out minor engine repairs for example sea water pump repairs right through to very large engine rebuilds and everything in between. Our service vehicles are fully equipped to travel to your vessel to carry out engine servicing, stern drive and sail drive servicing, generator servicing and all engine repairs. Whether your “pride and joy” is moored at one of the many marina locations throughout Brisbane, Gold Coast or Sunshine Coast or just at your back door we are able to come to you. No repair is too small or large. Also specialising in engine repower packages. We are authorised Volvo Penta and Yanmar dealers. Did you know that we also carry out monthly checks and yearly servicing and re-fuelling on Stand by Generator sets. We also carry out load bank testing on stand by generator sets too. Whether your Generator Set in located in the Brisbane area or in the country we are able to travel to various locations throughout South East Queensland. Just give us a call or email to discuss your needs. 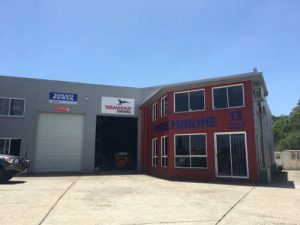 Moore Marine has a fully equipped workshop to handle the smallest of jobs to large marine and industrial engine overhauls and engine re-powering. Please contact us with the details listed or fill out our online enquiry form.